This is a modification for Votan's Mini Map and adds new circular border styles to the mini map. 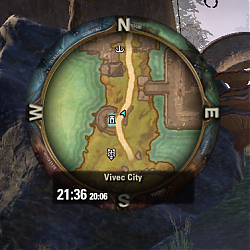 As this is not a replacement, but a modification of Votan's Mini Map, you have to install both Votan's Mini Map and this addon. Is there any easy way to “easily“ make it rotate so that the upper side is always where the player is looking at? It would be a nice addition, in my opinion. Last edited by NTak : 03/15/19 at 11:40 AM. Minimap doesn't display border textures for some reason. All I get is weird cross-shaped map. My first guess would be that you installed the addon in a subfolder. Just checked, seems to be installed correctly. And I use Minion, anyway. Last edited by AlexFullmoon : 03/10/19 at 03:55 AM. Really like this, so much better to me. It just seems to fit the game better visually. Works flawlessly, works well with gamepad. Thanks so much for your work. I really like the fixed compass, I'm better oriented, please don't change it. Last edited by TorbenSkar : 02/24/19 at 06:45 AM. I didn't like much the regular Minimap (no offense! ), but with the circular-compass-style, I really like it. Last edited by NTak : 01/16/19 at 04:48 AM. Hey. Love the minimap mod. 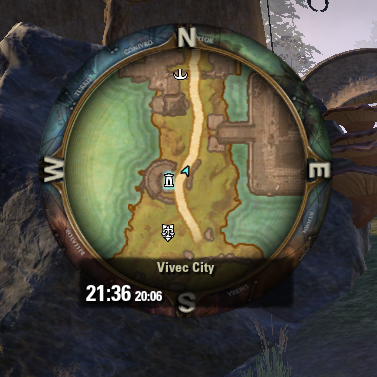 Since the Murkmire update though I've noticed something odd. In the top right & left corners of the map there 2 square cutouts that just display the game screen space behind the map. Dont know if its a bug or not. instead of the map. Sometimes theres also a wierd overlap like 2 maps parts display over each other in the top third of the circle. Using Astro Lens Wheel. It only happens when I press select on my controller to go into the world map. If I hit WINDOWS button or alt+tab to desktop n go back to the game the minimap is fine until I press select again to open the world map. Last edited by XIIICaesar : 10/17/18 at 07:16 AM. Ok, this is weird! All my existing characters have the square minimap but I created a new character today and he has the circular minimap!!! Last edited by SteveCampsOut : 05/24/18 at 06:18 PM. You can resize the minimap. If your mouse is at the left/right or lower edge of the black information panel, you can resize it. Is it possible to remove that Clock and the background? Or make a transparancy slider or something? 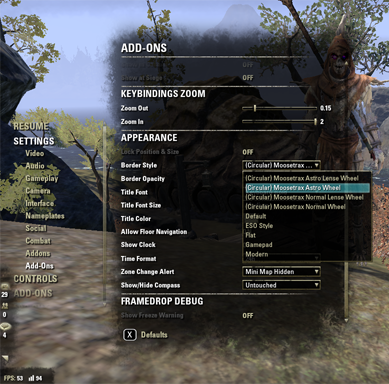 The settings of Votan's Minimap work with this addon. Simply disable the clock and change the transparency in the settings. Last edited by Shinni : 08/15/17 at 11:57 AM.